The Haredi newspapers are at it again. Back in 2011 I wrote several blog posts (here on this blog, in the Huffington Post, and in The Jewish Week) about how a couple of Haredi Jewish newspapers had used Photoshop to remove women from iconic photos. Back then it was the Ultra-Orthodox Hasidic Jewish newspaper Der Tzitung removing Hillary Clinton from the famous photo of when Osama Bin Laden had been captured. My article in The Jewish Week was even shown on The Colbert Report when Stephen Colbert discussed the topic. 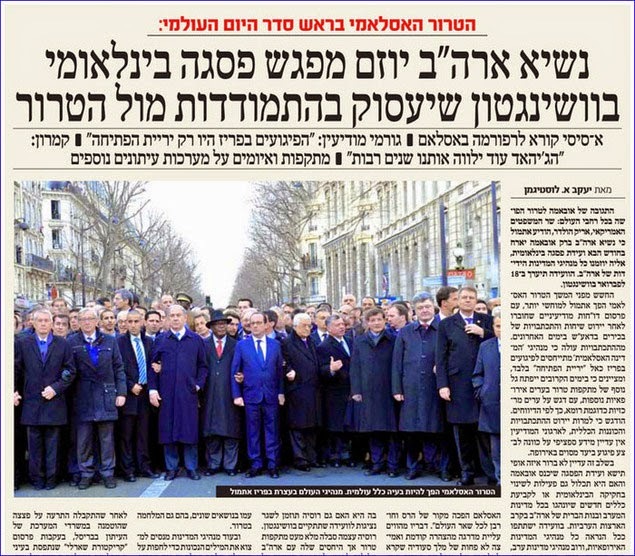 Now, the Haredi Israeli newspaper HaMevaser has digitally altered the now iconic photo of the 44 world leaders who marched in Paris on Sunday to express solidarity with France. The paper removed German Chancellor Angela Merkel, Paris Mayor Anne Hidalgo and EU foreign affairs and security chief Frederica Mogherini. Another female leader, Danish Prime Minister Helle Thorning-Schmidt, was cropped out of the photo (one of her hands remains visible in the photo). The Israeli news site Walla.com first noticed the Photoshop job. The iconic photo of world leaders at the march in Paris after being altered to remove the women. 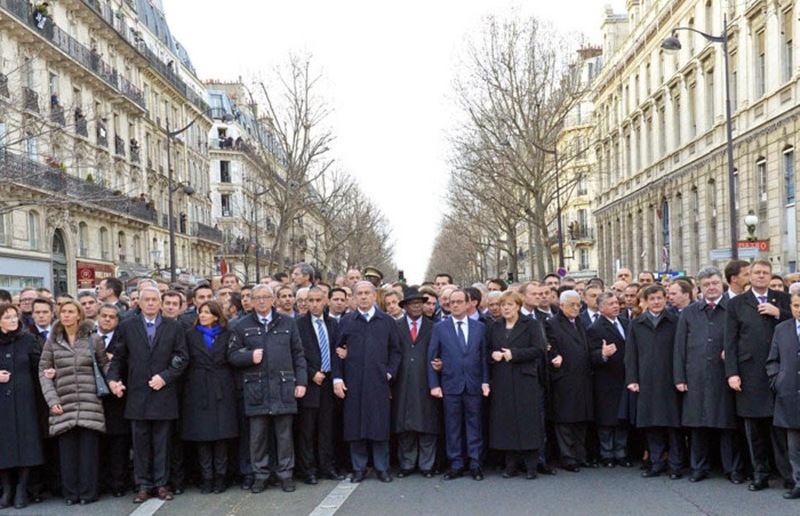 The iconic photo of world leaders at the march in Paris before being altered. As I explained almost four years ago, this is not only an absurd thing to do, but it's completely dishonest and unethical as well. The idea that these Haredi newspapers are concerned about showing fully clothed women is ludicrous. In trying to uphold a Jewish law (modesty), they are actually transgressing another Jewish law. This act of censorship is a violation of the Jewish legal principle of g'neivat da'at (deceit) as they are altering the historical record. The doctoring of photographs like this is referred to as "Fauxtograpphing." They are a newspaper, but they are not presenting the news. They are intentionally altering the news as it occurred. They are substituting men into a photo when those men weren't actually standing there. Furthermore, the iconic photographs that the newspaper is using are released for the fair use of media agencies under the stated understanding that it is illegal to alter the photo in any way. Thus, any news outlet that digitally alters the photograph is acting illegally and violating the copyright of the photographer who took the shot. I have to agree with Shmarya Rosenberg of FailedMessiah who wrote, "there is no Jewish law mandating the removal of normally clothed women from pictures like this." Refusing to publish photos of women in a newspaper is another example of extremist Jews trying to adhere to their rules of modesty while breaking rules of honesty and morality. Yes, editing off a woman is a common practice of the Haredi newspapers, and it's becoming easier to do that. Hillary Clinton is case in point. And now it is Angela. There are simply no words to express how silly and futile that is.Someone posed the question of what would be if she becomes president. Obviously a big problem.